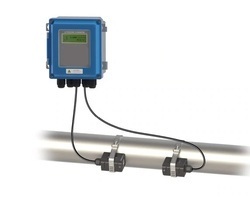 Dewpond's Ultra Sonic Flow Meters are best known for their long life and high end accuracy, that stands unmoved for a vast period of time. These flow meters are suitable for a wide range of liquid applications, like water, hot water, chilled water, sea water, waste water, crude oil, lubricating oil, deisel oil, fuel oil, chemicals, alcohol, effluents, bevarages, ultra pure liquids, etc. Dewpond Technology Private Limited is an ISO 9001:2015 certified company and is a leading manufacturer and exporter of Electromagnetic Flow Meters, pH meters, steam injectors, valves, etc. This makes us one of those companies where professionalism and human relations go hand in hand. Dewpond believes in need finding and innovation in technology. Our experts with a thorough and systematic study of your plant will offer the best solution for energy conservation and control systems. By virtue of these attributes, we are always the first preference for any solution required in process industries. Our company prides to be proven for its high quality, yet budget-friendly products and services. We make sure that customer service is pivotal and no compromise is ever made to that. We mold our solutions into the customer’s requirements, not the other way round.